Your website is your online identity. There are few legal things to take care of after launching your website. These things are important for all websites. Thankfully the process is not too involved. But it gets difficult for new website owners to create these legal pages. The problem is content they should add on these pages. Also which legal page to create is other question. This post is written to help you. I will give downloadable copy of mandatory legal pages your website should contain. You can just make some basic changes as per your website need and publish them. I have been using these pages on my sites for quite sometime without any issues. The page content serves most website types.Lets understand more about the legal pages we are talking about and why they are important. 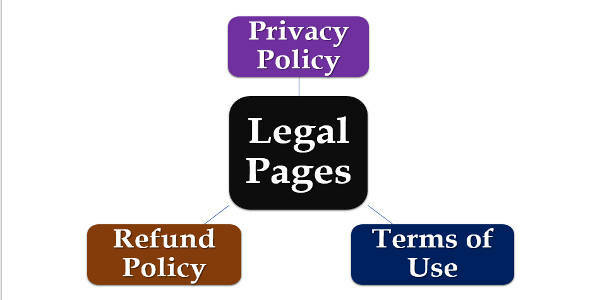 Why are legal pages important? Do you know why companies or contracts have them? They are here for a reason. The main reason of having these pages are Legal. In this post I will not cover legal complications. That are beyond scope of this post. If you do not have these pages then you may face issues in future. Loosely created legal pages may land you in trouble. So even if you have simple educational blog in place make sure to create these pages. Later in the post I will give brief idea of these pages. I will also refer these pages as mandatory pages. I will explain importance of each page while discussing about them.You can create all of them on your site.There will not be an issue if you create all the pages on your site. However you can also choose to create only the ones needed based on description mentioned below. In this post we will cover all mandatory pages. Below is brief description of pages and website types they are applicable for. Note there is no harm in creating all the pages as well. Also replace website name (Udinra) and website URL (https://udinra.com) with yours. READ How to remove Serve Scaled Images issue from website? After making above changes you can publish the page. You can link to this page from footer of your website. In case you are sing Affiliate program or Membership services then I recommend downloading Terms and Conditions.You can also have both on your site if you want.You can explicitly tell members to Accept your terms and conditions. But for clarity and simplicity I recommend sing two different files. The terms and conditions is only displayed and agreed upon by Affiliates. Refund Policy page is not applicable for all websites. It is only applicable if you are selling any product. The product can be digital good or physical item. A clear Refund Policy helps the Buyer as well as protects you. Websites with clear Refund policy page instills confidence in Buyer before purchase. They are rest assured that they can exercise the refund policy rules to get their money back.You can skip this page if you want. But it is better to create one for future safety. For example you may have a blog but in future you may want to sell a product.At that time you may forget to create a refund policy. So it is better to create one now and leave it. Create a new page on your site with title Refund Policy. Paste the content of downloaded Refund Policy. The Refund period in download refund policy is 7 days. You can increase it as per your requirement. 30 days is new norm. The text file content are in HTML format. So copy the content as it is. It will display better in browser. The file content can be used on website created by any technology type (WordPress, Joomla or Drupal or any other technology). You can make changes in the files as mentioned above.